This episode is made up of interview recordings from Meet Magento Spain. The first is with David Manners, a long-standing contributor turned Community Engineer at Magento. 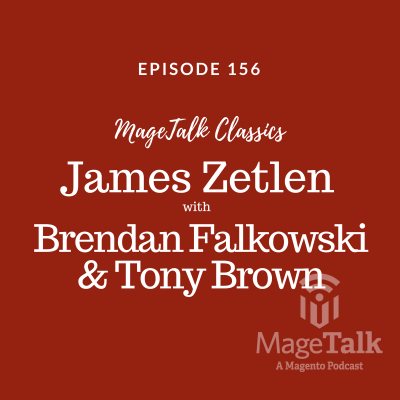 Originally from the U.K. and now residing in Germany, David Manners once hosted Mage Talk and is part of the new team at Magento that can help you contribute to the platform. Currently, 20% of the code in Magento 2 has come from the community! The guys are joined by the Head of Business Intelligence at Magento and Former CEO of RJMetrics. We hear about Roberts career history and how RJMetrics started and grew, despite having a logo that looked like a pair of underpants. Rob tells us how we can be more effective with our marketing by using the data gathered by Magento BI. By looking at the broader story of a customer you can find where your most valuable customers are being acquired from and make informed decisions based on your strategy – “More often than not the channel that brings in the most first time purchasers is actually not the channel that is bringing in the highest customer lifetime value customers”. The guys also discuss the constant shifts in data you will face when you change your strategy based on previous data and how to deal with that. Social is an exciting space for advertising and personalization. Rob tells us about one of Magento’s latest acquisition Shopial, which now forms the core of Magento Social and the guys discuss the problems it will solve for merchants, especially those who are just starting out with social advertising. RJMetrics spent 7 years building their product, pushing for growth and being able to connect to any data source under the sun, but the real key to creating deep product market fit and deep customer value is focus and so Magento BI Essentials was born, which is the affordable solution for merchants. Magento BI is available for all versions of Magento, TODAY. Magento 1 / Magento 2 / Magento Cloud / Community / Enterprise – it works! It will pull all your data retrospectively and even other sources, e.g. if you started on a different platform and then moved to Magento, you can still get a full overview of your business from the off. These show notes are brought to you by Rebecca Brocton – go check out her youtube channel! Our series from IRCE 2016 continues with an interview with Agnes Rey-Tinat of iD Commerce + Logistics – shipping is hard, and direct to consumer shipping now has to take different types of products and challenges into account. 6:42 Who is Jamie Clark?